Thoroughbred champion Cigar died last evening, Wednesday, Oct. 7, at Rood and Riddle Equine Hospital from complications following surgery for severe osteoarthritis in his neck. Foaled April 18, 1990, the Hall of Fame horse and longtime visitor favorite at the Kentucky Horse Park’s Hall of Champions was 24. At retirement, Cigar’s career had a total of 19 wins out of 33 starts with earnings of $9,999,815, which was a record at that time. He was voted Champion Older Male and Horse of the Year in both 1995 and in 1996. The first horse to tie racing legend Citation’s record of 16 consecutive victories, Cigar had lived at the Kentucky Horse Park since his retirement in 1999. Cigar was inducted into the National Museum of Racing and Hall of Fame in August 2002, his first year of eligibility. 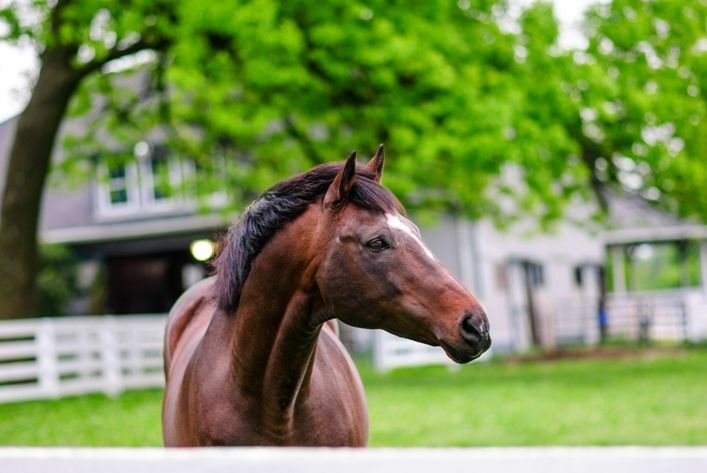 Cigar had been under the care of a team of veterinarians from the Hagyard Equine Medical Institute and the Rood and Riddle Equine Hospital in Lexington, some of the best equine veterinarians in the world. The team of veterinarians and surgeons had deemed that spinal surgery was the only option to relieve the pressure and ensure the highest quality of life for the horse. Surgical correction was performed by a team led by Dr. Brett Woodie, of Rood and Riddle, Dr. Laura Werner, of Hagyard Equine, and Dr. Steve Reed, of Rood and Riddle who pioneered the special procedure performed. Hopkins said Cigar will be remembered as one of the greatest horses the world has ever seen, and thanked fans who have supported Cigar and the Kentucky Horse Park since his retirement. She also noted the efforts of park team members who have taken excellent care of him over the years, including Wes Lanter, Robin Bush and the late Cathy Roby. Like the other Hall of Champions horses who died in retirement at the park, Cigar will be buried on the Memorial Walk of Champions near Thoroughbreds Alysheba, Bold Forbes, Forego, John Henry and Kona Gold; Standardbreds Cam Fella and Rambling Willie; American Saddlebreds CH Imperator, CH Skywatch and CH Gypsy Supreme; and American Quarter Horse Sgt. Pepper Feature. A public memorial service will be held for Cigar at a future date, yet to be determined.